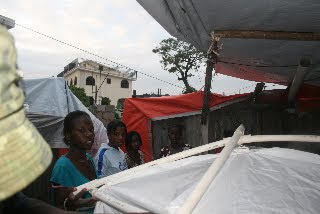 Delmas 57, the narrow street where Andre's family lives, has turned into a tent city for about 70 families. Many of the neighborhood houses, like Andre's family's house, survived the earthquake with just cracks, but everyone's too spooked to sleep inside. 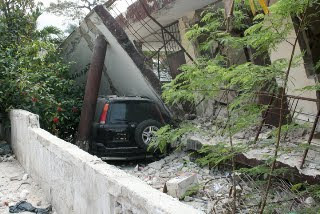 Only three houses have been destroyed completely on their street, the dead still trapped inside the rubble. 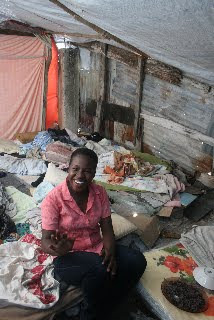 By the time Andre arrived on March 9, the smell of death had already left the area. 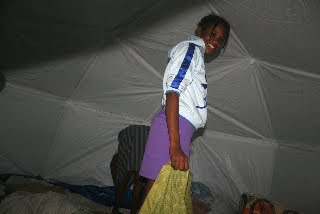 Here's Andre's cousin Joanne and her fiance in the makeshift shelter that 14 of Andre's aunts, uncles and cousins were sharing, made from a very large tarp that they got from their minister. 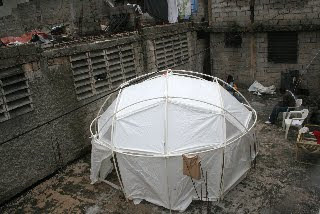 When it rained, the ground got wet, so they asked Andre for one of our Shelter Systems domes. We had hoped to set it up on the land in the mountain village, but they're still negotiating. 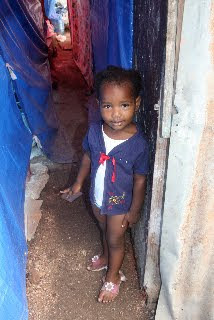 Here's a little cutie in the camp who I couldn't resist photographing. We set it up on the rooftop of his uncle's house so they could see what it looks like and so they'd believe that it's really 14' in diameter. I had hoped they would keep the other structure and move one family into the dome. But they're too afraid to sleep on the rooftop for fear that a bigger earthquake will come and topple the walls from the neighboring houses. So Andre took it down and helped them set it up in the camp. They tried to leave up most of their original shelter, forgetting about the 7' height. 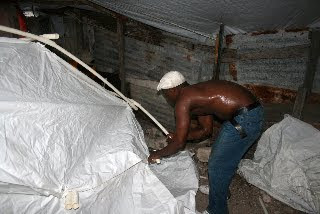 As Andre was setting it up, his uncle was still taking down some of the supports of the tarp. I was afraid they'd puncture the dome with the nails, but luckily only one small rip had to be patched with duct tape. By evening, they were ready to lay out all their bedding. All 14 fit cozily into the dome which is designed for 8-10 people. Andre and I and his brother-in-law are the only ones in the whole neighborhood who are sleeping inside a house. I've been trying to set an example that it's safe. I told them about Santa Cruz's 6.9 earthquake in 1989 and how we were told it might be 50-100 more years before the pressure builds up on the Loma Prieta fault line again. 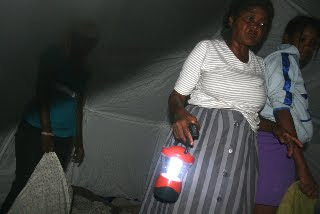 Port-au-Prince hasn't had any aftershocks for 3 weeks, but most residents are afraid to sleep inside even if their house is intact. The city is going around and inspecting the houses. Some, like the one above with the SUV trapped inside, got red tagged, meaning they have to be demolished. This house is next to the camp. Other houses got yellow tags meaning they must be repaired before they can be inhabited. Andre's house got green, which means it is inhabitable now. 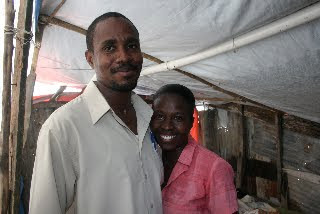 Andre's stepfather is a builder, so he will hire some people to help him repair. Materials alone are $4,000-$5,000, but the labor will be cheap, just the opposite in the U.S. where materials are cheaper than labor. The rains are beginning. 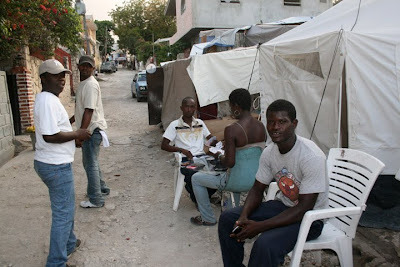 I wonder how long it will take for many Haitians to venture back inside their houses. But for hundreds of thousands, they no longer have a house to go back into and they will be living in tents....maybe for years.